Reverse Osmosis system is the most effective to provide drinking water. Reverse Osmosis Systems (RO): Water pressure is used to force water molecules through a very fine membrane leaving the contaminants behind. Purified water is collected from the "clean" or “permeate” side of the membrane, and water containing the concentrated contaminants is flushed down the drain from the "contaminated" or “concentrate” side. The average RO system is a unit consisting of a sediment/chlorine pre filter, the reverse-osmosis membrane, a storage tank, and an activated-carbon post filter. Reverse osmosis removes salt and most other inorganic material present in the water, and for that reason, RO lends itself to use in places where the drinking water is brackish (salty), contains nitrates or other dissolved minerals which are difficult to remove by other methods. Reverse Osmosis is the most effective and economical way to provide your family with high quality drinking water. Reverse Osmosis is the process by which water molecules are forced by your household water pressure through a semi-permeable membrane. Contaminants are rinsed to the drain while your high quality filtered water is stored in the holding tank. Delicious Coffee, Tea & Beverages, and Water for Pets & Plants. 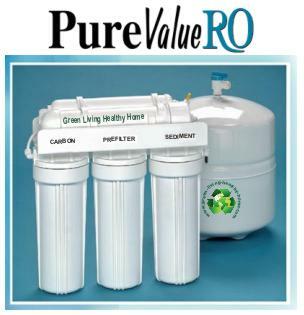 Purevalue RO also has a model with UV antibacterial action. The hard glass germicidal lamps provide an economical way of treating water requiring a 99.99% reduction of bacteria and virus and protozoa. This process is accomplished without adding any harmful chemicals to your drinking water. Stage 1 5 Micron Sediment Filter: Removes dirt, sediments, sand, and other physical particles. Stage 2 Carbon Block: Reduces chemicals such as chlorine, that may be present in your water supply. Stage 3 2ND Carbon Block: Further reduces organics, odors, and other chemicals that might be present in your water supply. Stage 4 Reverse Osmosis Membrane: 50 gallon per day membrane removes 93-97% of dissolved mineral salts and other contaminants in the water supply. Stage 5 Post Carbon Filter: A final polishing process that enhances and clarifies your drinking water. 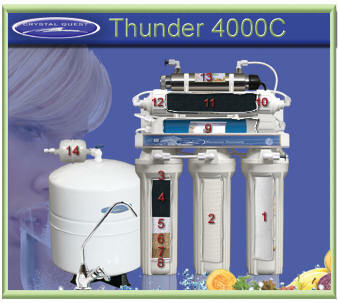 Thunder 4000C reverse osmosis system provides you with great tasting water. Removes hundreds of contaminants from water. Comes in 3 sizes 50 GPD(gallons per day), 75 GPD, 100 GPD. It has a 14 stage filtration system, and UV water sterilization that kills 99.9 % of bacteria in the water. • In stage 1, water travel through a 1 micron solid carbon cartridge for removing volatile organic carbon compounds (VOC's), insecticides, pesticides and industrial solvents also removes sediment, silt, sand and dirt. Also to extend the life of the unit. • In stage 2, water travels through a .01 micron Ultrafiltration (UF) membrane. Ultrafiltration (UF) is an important purification technology used for the production of high-purity water. UF is effective for the removal of colloids, proteins, bacteria, viruses, parasites, protozoa and pyrogens (e.g., gram-negative bacterial endotoxins), other organic molecules larger than .01 micron, and most other water contaminants known today. • In Thunder 4000C reverse osmosis system stage 3, Water flows through pre one - micron filter pads (1 micron equals 1/25,000th of an inch), which remove suspended particles such as silt, sediment, cyst (Giardia, Cryptosporidium), sand, rust, dirt, and other undissolved matter. • In stage 4, water passes through granulated activated carbon (GAC). GAC is universally recognized and widely used as an effective adsorbent for a wide variety of organic contaminants, such as chlorine (99.9%), chemicals linked to cancer (THM's, benzine) pesticides, herbicides, insecticides, volatile organic compounds (VOC's), PCB's, MTBE's and hundreds of other chemical contaminants that may be present in water, bad taste, and odors from your drinking water. Carbon is extremely porous and provides a large surface area for contaminants to collect. 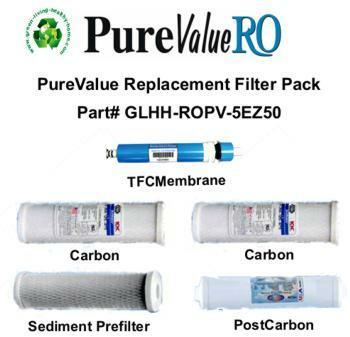 Carbon-only filters must also use their capacity for chlorine removal, resulting in a shortened life. They also may use a bituminous coal carbon, which is good at removing chlorine, but not as effective at removing chemicals. We use a high-grade coconut shell carbon that is most effective at removing chemicals. Coconut shell carbon provides a significantly higher volume of micro-pores than either coal, wood or lignite- based carbon. As a result, it is more effective than other carbon types in removing trihalomethanes (THM's) and other chemicals from municipally supplied water. Since our Thunder 4000C REDOX media removes the chlorine before it reaches the carbon, the carbon capacity is not wasted on chlorine and is free to concentrate more effectively on organic contaminants. Granular activated carbon is a highly adsorbent material used to remove contamination from water. Activated carbon has been known as a miracle filter media by many researchers because of its unique ability to remove offensive tastes, odors, color, chlorine and volatile organic chemicals, pesticides and trihalomethanes (a group of suspected carcinogens). Briefly, activated carbon acts like a sponge, with a large surface area to absorb contaminants in the water. The surface area of one pound of activated carbon is equal to 125 acres. Many scientists believe this is a result of an affinity that these chemicals have for carbon because of Van Der Waal forces. Activated carbon is the preferred treatment and method recommended by the EPA to remove a host of potentially hazardous and possibly carcinogenic chemicals in drinking water. • In Thunder 4000C reverse osmosis system stage 5, Water flows through the ion exchange resin, reducing heavy metals such as lead, copper, aluminum, and water hardness. • In stages 6 and 7, Water flows through a bed of media made of a special high-purity alloy blend of two dissimilar metals - copper and zinc . it is a major advancement in water treatment technology that works on the electro-chemical and spontaneous-oxidation-reduction (REDOX) principles. Chlorine is instantaneously and almost inexhaustibly oxidized. Tests on the Thunder 4000C reverse osmosis system cartridge have shown 99+% chlorine removal past 20,000 gallons of water. In comparison, carbon cartridges of comparable volumes drop below 90% effectiveness after only 4,000 gallons. Iron and hydrogen sulfide in the Thunder 4000C are oxidized into insoluble matter and attach to the surface of the media. Heavy metals such as lead, mercury, copper, nickel, chromium, cadmium, aluminum, and other dissolved metals are removed from the water by the electrochemical process. They are attracted to the surface of the media, much like a magnet. The media inhibits bacterial growth throughout the entire unit. In fact, it has been shown to be reduced up to 90%, eliminating the need for silver, which is commonly used in carbon-only filters (silver is considered a pesticide by the EPA and, as such, must be registered with them). • In stage 8, Water flows through another one-micron filtration pad for further reduction of undesirable particles. The end result is a great reduction or elimination of a wide variety of contaminants. • In stage 10 and 12, Water flows through another one - micron filter pads (1 micron equals 1/25,000th of an inch), which remove suspended particles such as silt, sediment, cyst (Giardia, Cryptosporidium), sand, rust, dirt, and other undissolved matter. • In stage 11, water passes through granulated activated carbon (GAC). GAC is universally recognized and widely used as an effective adsorbent for a wide variety of organic contaminants, such as chlorine (99.9%), chemicals linked to cancer (THM's, benzine) pesticides, herbicides, insecticides, volatile organic compounds (VOC's), PCB's, MTBE's and hundreds of other chemical contaminants that may be present in water, bad taste, and odors from your drinking water. • In stage 13, water passes through an Ultraviolet Water Sterilizer System manufactured with axial flow reactors in 304 stainless steel. The hard glass germicidal lamps provide an economical way of treating water requiring a 99.99% reduction of bacteria and virus and protozoa. This process is accomplished without adding any harmful chemicals to your drinking water. CRYSTAL QUEST® Ultraviolet Water Sterilizer System is the most ecological way of treating your water. • In stage 14, water travels through a .01 micron Ultrafiltration (UF) membrane. Ultrafiltration. UF is effective for the removal of colloids, proteins, bacteria, viruses, parasites, protozoa and pyrogens (e.g., gram-negative bacterial endotoxins), other organic molecules larger than .01 micron, and most other water contaminants known today. Click the down arrow to choose the reverse osmosis system unit that produces the quantity of (GPD) gallons you require per day. Click on the links below to see some of the other Water Purifier systems that we are offering.